It was a long wait to get on the court this season for Glenn Robinson III. The Indiana Pacers were patient with him as he rehabbed from his ankle injury in training camp and he’s quickly become a key contributor off the bench. While Head Coach Nate McMillan expected to only play him 5-10 minutes in his first game back, Robinson played 18 minutes in his debut, showing he was ready to make plays as the backup small forward. The wait is almost over. 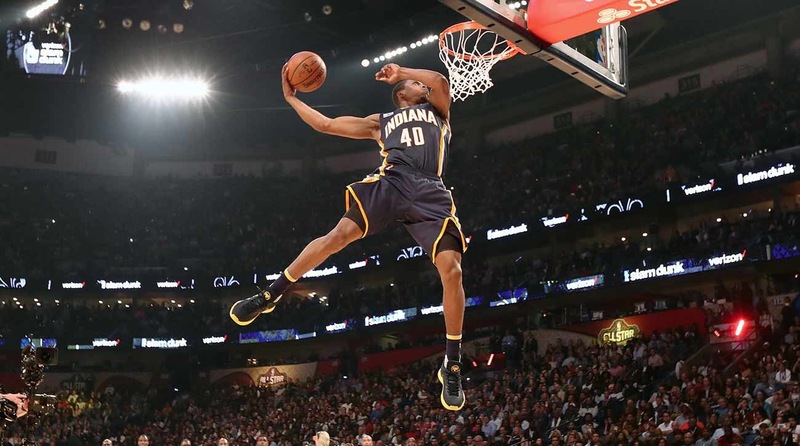 Glenn Robinson III will return to game action for the first time with the Indiana Pacers this season. After his first full practice with the team, Pacers Coach Nate McMillan said he looked great and much improved from last season. McMillan confirms @GRIII will get limited minutes on Friday. He says he's 2X the player he was last season. Should be interesting to see what he has and how he fits. Myles Turner and Glenn Robinson III both took another step towards returning to the court for the Indiana Pacers at practice on Tuesday. Myles Turner is listed as questionable against the Phoenix Suns tomorrow night. A positive sign since the team planned on going week to week with the ligament and muscle injuries in his elbow. Turner looked good shooting the ball after practice, so it seems likely that his return is imminent barring any setbacks even if he does miss tomorrow. Robinson III practiced for the first time with his teammates today after returning for individual drills before the recent 5-game road trip. His return is still going to take some time, however. Glenn Robinson III (left ankle rehab) practiced with the team for the first time since late September. GRIII is “still a ways away,” coach McMillan said. Small chance he plays before the All-Star break. Only a small chance to play before the All-Star break is a little less optimistic sounding than Robinson was in a recent interview with Indiana Sports Coverage’s Grant Afseth. Glenn Robinson III’s severe ankle sprain has gone from taking a quarter of his season to at least half of 2017-18 for the breakout candidate. You may be curious after watching Glenn Robinson III’s amazing Saturday night in the Dunk Contest how many Pacers have ever competed, let alone won, a dunk contest in the past besides Trey Dog (who I incorrectly gave only a 20% chance to win). Over the 31 years of the contest including one ABA, seven different Pacers in addition to King Glenn III have competed in the NBA Contest. Zero in the one year the ABA had their contest in 1976 before the merger. Pacers ABA legend Darnell ‘Dr Dunk’ Hillman won the first NBA dunk contest in 1977 but it was a very different season-long contest back then. All 30 teams had a representative and competed one-on-one in a bracket like challenge. Until last night, Dr. Dunk had never received a trophy for the contest, but did get a check for around $15,000. Let the countdown commence. And feel free to let me know where I’m wrong on Twitter @TheCorner3Ross. He didn’t complete it till after his buzzer so it didn’t count but the idea was impressive: cut off the net, dunk, catch the ball with the other hand, and dunk it again, all in the air during one jump. Slap a sticker on on end of the backboard and dunk on the opposite end. Points for the prop. Nothing fancy on the dunk. PG took more attempts than he had stickers unfortunately. For how long he is, it should’ve been from further away. Sadly like much of Bender’s career, his performance was a disappointment. At least he didn’t get hurt! #6 2012 Paul George dunk over Roy Hibbert. Hibbert is 7’2″. Yes, Roy ducked a bit and PG used his hand but still impressive nonetheless. Originally Dahntay Jones was throwing a pass to George, but he couldn’t get it completed. Lance Stephenson’s always looking for an easy assist, and no one dunks with ease and force like Gerald Green. Over one All-Star, one mascot, and a cheerleader backwards slam. It clinched him the contest. In my opinion, this should have won him the best dunker crown in this strange conference battle dunk contest. The Dunk that won him the contest and made him the first Pacers player to do so. Thank goodness he threw himself a terrible pass that made this dunk awesome. Left hand over two people while his head almost hits the rim. Just nuts. I hope there is a shirt with this on it soon. He earned every bit of this championship. Way to go, King Glenn III. The very first Pacer in the Dunk contest came early in 1985 & 1986 Terence Stansbury. He competed two years for the Pacers and one for Seattle. He made the Semi-Finals both times with the Pacers but lost out to Dominique Wilkins at home in Indianapolis in 1985 and Spud Webb the following year in 86. 1991 saw Kenny Williams compete for the Pacers in Charlotte for the Dunk Contest. Kenny would not make it out of the first round finishing 5th overall. The overall champ that year was Dee Brown of the Celtics. Now we get into some names most fans remember. The next Pacer to compete was a Davis brother. Antonio Davis in 1994. AD didn’t make it out of the first round either, finishing 5th. Maybe being ‘penalized’ for being the big in the group. The champ that year was Isaiah Rider. Oh what could have been for the next Pacer contestant: the Pre-Durant, Durant style player. In 2001, Jonathan Bender competed for the Pacers. His length and versatility should’ve equated to amazing things on the court, but Bender’s knees never cooperated for very long. Bender didn’t make it out of the first round either, finishing 5th (I’m seeing a pattern here). The champion that year was Desmond Mason. All these 5th place finishes. Would a Pacer ever do well in this contest? In 2004, with a field of four players, the Pacers Fred Jones showed that he could. 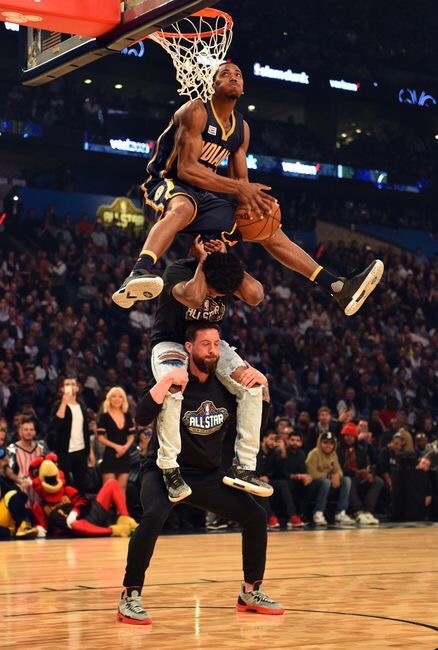 In maybe one of the weaker dunk contests to date, Indiana Jones bested the two-time defending champ Jason Richardson for the title spot with two 50-point dunks on his way to victory. Don’t get me wrong, I’m very proud of Fred Jones but maybe the voters were tired of J-Rich. But a W is a W. There has only been one 3-time champ at the Dunk Contest and that was Nate Richardson. So J-Rich had an uphill battle. The next time we saw a Pacer in the Dunk Contest was Paul George in 2012 under a new format. Paul George competed twice (again in 2014). The champ would be decided entirely by fan voting this year. PG came out strong with dunks over Roy Hibbert (7’2″). Followed by his glow-in-the dark jersey dunk (would’ve been cooler in the light) and ended with the sticker on the backboard other side of the rim dunk. Sadly the fans voted incorrectly. As they normally do when given the power for the All Star Game (I’m looking at you Zaza Pachulia). PG unbelievably finished only 3rd with 24% of the vote. Brief former Pacers bested George in the fan vote: Jeremy Evans got 29% and Chase Budinger got 28%. In 2013 Gerald Green competed in his third contest with his third team. An impressive alley-oop off the side of the backboard from Lance Stephenson followed by an ambitious dunk he wasn’t able to put down. He cut off the net so that he could dunk the ball, catch it with his off hand and dunk the ball again. He wasn’t able to complete it and scored low, unable to advance. The winner that year was Terrance Ross. Paul George would come back two years later in 2014. Again though, the NBA tweaked its format. A team format was adopted. 1st round was freestyle followed by one-on-one battles. PG was teamed up with the East consisting of Terrence Ross and John Wall. The East won the night but John Wall was voted as the Dunker of the Night (by the fans). Finally this year, I hope most of you were able to watch. 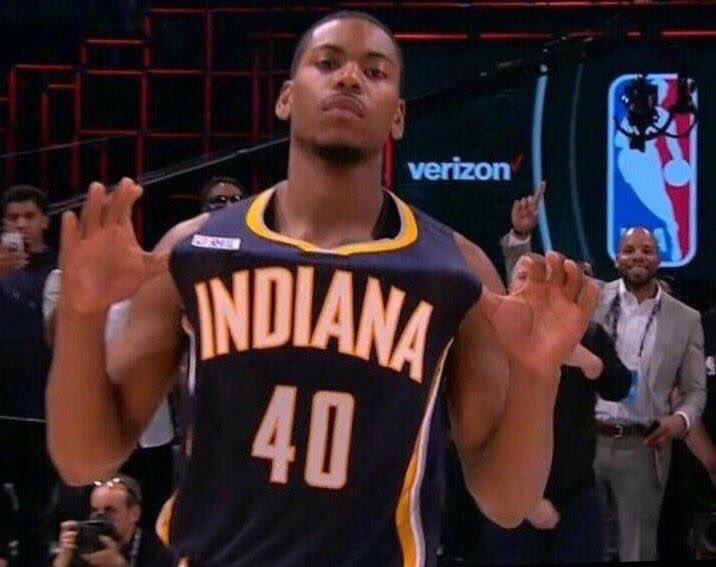 2017 Glenn Robinson III wanted to #Shocktheworld and man did he do so. While the competition wasn’t the same level as years past, Glenn capitalized. With Aaron Gordon fizzling out in the first round and Glenn scoring a 50 with his first dunk. He was easily into the final round and sealed the deal jumping over three people in an impressive fashion, bringing home the Pacers second-dunk title and a nice $100,000 for his victory. Pacers dunkers are a combined 2-9 all time in the contest. We’ll see if GR3 comes back next year to defend and become the first Pacers Dunking Dynasty. Glenn Robinson III visited the Plainfield Fire Department earlier today, and they had a little fun with the fire truck’s ladder.